Just when the weather was taking a turn for the better with sunny days and warmer temperatures, it turned cold and rainy. 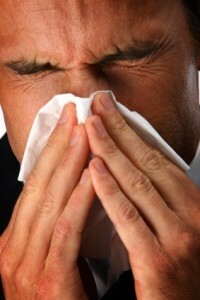 Now it seems that everyone I know has the sniffles including me. Not the flu or the croup just a plain old ordinary “common” cold. Soaking in my Hot Spring hot tub last night I started thinking about using the hot tub to fight a cold. A hot tub is typically used for relaxation. And, relaxation has some tremendous benefits, especially after you step out of your hot tub. Why not use your hot tub to help your body fight the flu or a cold? 1. Hot is Good. There is some scientific evidence that raising your body temperature will help your body fight cold germs, so have the heat set at the hottest safe level, usually about 104 degrees Fahrenheit. While it may feel uncomfortable at first, you’ll soon become accustomed to the heat. And, the only way that your hot tub will help you fight off a cold or flu is if it’s hot enough to actually raise your body temperature so that you sweat. 2. Make Sure the Water’s Clean. Before you get in, check the water.If your chemicals aren’t balanced and sanitation levels are off, it’s not a good time to go in a hot tub let alone when you’re sick and your immune system is low. Get some test strips and follow the included instructions to balance everything, especially the pH levels of the water and the total chlorine count. If you’re still using chlorine-better to switch to SilkBalance in combination with ozone and silver ion cartridges that really keep water clean and healthy. 3. Don’t lie on the couch feeling miserable. Get in the hot tub! Go for twenty minute soaks every few hours while you’ve got a cold or flu, and make sure to keep soaking until you’re starting to feel better. The idea behind hot tub treatment of a cold is to get your body temperature elevated and to keep it elevated, so try to spend as much time in the hot tub as you can, or at least as much time as you feel relaxed in the hot tub–if it becomes a pain, don’t worry about it, get out and get some rest. And, the hot tub will help you do that. You’ll be relaxed enough to fall into deep sleep. 4. Use a Salve Under your Nose. A small dab of mentholated salve (good ole Vicks) under your nose will open up breathing passages and help soothe the irritated skin at the base of the nose. Menthol, eucalyptus and camphor all have mild numbing agents that help relieve the pain of a nose rubbed raw. Put a fresh dab under your nose when you get into the hot tub for maximum effect. 5. Blow Your Nose Often and the Right Way. Experts say its important to blow your nose regularly when you have a cold rather than snuffling mucus back into your head. The heat from the hot tub will make your nose run which is a good thing. Keep a towel handy to dry your hands before you reach for a tissue. Be careful how you blow. Blowing too hard can cause an earache. The best way to blow? Press a finger over one nostril while you blow gently to clear the other. 6. Stay Hydrated. Hot tubbing is actually dehydrating as you are sweating in the tub. Drink plenty of water before, during and after soaking. And make sure you stay hydrated for as long as your cold or flu lasts. If you can bear the thought of drinking something hot in the tub, hot liquids like herbal teas and the perennial chicken soup relieve nasal congestion, help prevent dehydration and can soothe the uncomfortably inflamed membranes that line your nose and throat. Tea and coffee are diuretics, so avoid them while hot tubbing, and alcohol-even your old family remedy for hot toddy-is a definitely a bad idea with or without a cold. If you’re lucky enough to take zinc at the first sign of the sniffles, you may just shorten your sick time reports today’s New York Times. Remember to consult your doctor if your cold symptoms persist or you start to feel worse. I’d love to hear your tips for using your hot tub to fight a cold or the flu. Post in our comments section below. “A soak a day keeps the doctor away”, that’s what I say! 5-6 years ago I was discussing this very topic with one of our long time hot tub owners. He swears by daily hot tub use for preventing the common cold. So he got me thinking..I did a little research and it’s so true! After that, I have become a dedicated daily soaker. I haven’t had any sinus congestion, colds and flu for years! Thanks so much for writing. Love: “A soak a day keeps the doctor away.” Great motto. And, it’s true. Continued good health to you and happy soaking! Thank you so much for the tips. I really needed something like this. I’m in the gym every day and when I have a cold I would stop going. now I can keep going since they have two wonderful hot tubs. Thanks for writing. I’m so glad you found the post helpful. My only thought on gym hot tubs is to make sure they’re clean. You’re in the gym every day?! I’m impressed. It is great to know hot tubs are good for helping a cold. But what about every healthy person there, that you are now exposing to your cold germs? It’s like when parents send their kids to school sick. Sorry….just sayin. Pam–The point of using the sauna is that it helps ward off a cold or flu. And, if you end up with one, will help you recover more quickly. My understanding from all the research done is that the sauna heat kills/neutralizes bacteria and germs, so there shouldn’t be cause to worry about exposing others. I live in England at the moment the temperature outside is cold but mild, is it still safe to use the hot tub to cure my cold or would this make my cold worse. As the post says, heat is good for curing a cold. Hope you’re better by now. People take hot baths during the day all the time. As long as your doctor doesn’t have any issues with it while you’re ill, I can’t see why it would be an issue.